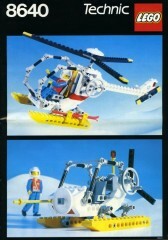 Today's random set is 8640 Polar Copter, released in 1986. It's one of 8 Technic sets produced that year. It contains 238 pieces and 1 minifig. It's owned by 1393 Brickset members. If you want to add it to your collection you might find it for sale at BrickLink or eBay. I've never had a set with one of those Technic figures before. I've always wondered what they're like. Technic figure scale set that ACTUALLY HAS A TECHNIC FIGURE!! Yep the box. It is a beauty isn’t it? These were the sets that increased the play value of a Technic set. Not only you could play with the set, but also you could swoosh the Alps, in mind of course. This was an awesome set. I had this and the smaller buggy, and those two Technic guys went on a lot of crazy adventures, mostly fighting Cobra, if I remember correctly. Love all these sets with Technic figures. I had only one unfortunately, the yellow Prop Plane (8855). Awesome set too. Those red skis are cool. I had one technic figure with a 2-in-1 set 8223 which also had a red seat like this set. The 2 builds being pretty similar to this as well, helicopter/hydrofoil. So it might have been inspired by this, despite being a 10 year later set. Bring back those figures and make scalable models. Always wanted one when I was little.. never got it... to the bricklink mobile! LEGO needs to re-enter Technic figure in sets. @andrelego I think they should. This is the only theme I collecte from Technic. The Polar sets were really playable and I still remember buying the largest set in the Alsterhaus, Hamburg. YES!! One of my all-time favourite (Technic)set from my childhood and I still, to this very day, have it assembled on the shelf! :) Omg, I love it!! This brings back memories. I own all the sets wich go with this set and had lot's of fun with them. The technic figure chairs, even if you don't have technic figures in the set, work well as minifig armchairs/thrones. There are places to build off of it on the arms and back, which the normal minifig seat piece doesn't have. Only problem is the minifig sitting on it is unconnected and can fall out, but it's not that of a big deal if it's up against a table. Not counting Slizer & Bionicle, I haven't bought a Technic set since they stopped doing these figures. We all love the Minifigure, but its proportions mean that you can never really build to Minifig scale. "Yep, that's how tall a car should be! We can squeeze in a single driver and the car is 5 times the length of his body, but that's fine! ".